Groucho Marx plays Quincy Adams Wagstaff, the new president of Huxley College, and Zeppo is his son Frank, who convinces his father to recruit professional football players to boost the Huxley team's chance of winning. Horse Feathers is hi-jinx meets higher education when Groucho signs football "stars" Chico and Harpo. 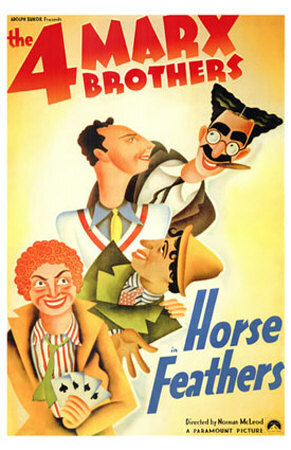 Groucho, Harpo, Chico, and even Zeppo star in five of the Marx siblings' funniest films. The teams' screen debut, "The Cocoanuts" (1929) finds the fellas at a Florida resort, where hotel owner Groucho woos Margaret Dumont; Groucho is "Captain Spaulding, the African explorer" in "Animal Crackers" (1930), a zany tale of high society and stolen paintings; the Marxes stow away on an ocean liner in "Monkey Business" (1931); it's hi-jinx meets higher education when college president Groucho signs football "stars" Chico and Harpo in "Horse Feathers" (1932); and Marxist satire reached its zenith when Groucho becomes leader of the country of Freedonia in "Duck Soup" (1933). 6 3/4 hrs. on five discs. Standard; Soundtrack: English Dolby Digital mono.